Some of Delhi’s best independently owned book stores (Fact & Fiction, the Bookshop, New Book Depot) don’t encourage discounts. Concessions kill the small players. The 31-year-old Bookworm, a landmark store in Connaught Place, shut down in 2008; its owner complained that book-store chains were doling out great discounts that he could never afford to give. Like compulsive shoe shoppers, most book-buying consumers need instant gratification. The Half Price bookstore in Select Citywalk mall, Saket, is unabashedly on the side of shoppers. Run by Roli Books, a Delhi-based publisher, the store in the Capital has 4,000 titles on a range of subjects—fiction, cookbooks, photography, history, design, art, architecture, management, and so on. Fancy stationery is also available. Though knick-knacks, such as designer pencils, each for Rs 100, are selling for Rs 50, not everything is 50 per cent of the original price. Some books can be bought for less than that, such as the hard-bound copy of David Priestland’s The Red Flag. The list price is Rs 2,600, the label charge is Rs 895. The section on photography is less exhilarating, only half as impressive as the collection at CMYK, Roli’s showroom in Mehar Chand Market that specializes in coffee-table volumes and gives no discount. There is no Cartier-Bresson, no Robert Capa, no Steve McCurry, but The Delhi Walla did spot an old Raghu Rai. The consolation is in the discount. The original price of Raghu Rai’s India is Rs 3,000, but here it can be bought for Rs 1,495. Roli’s own photo books start at Rs. 75 (I fell in love with the one on Satyajit Ray, Bijoya Ray Remembers Satyajit Ray at Work). Anybody wanting to build a personal coffee-table library, or just developing an interest in photography, might like to walk in. For fiction readers—those who are into Anita Shreve perhaps, and not Alice Munro—this book store could be addictive. At Rs. 100 each, they can pick paperbacks of authors such as Stephanie Bond, Jim Grace and Hal Duncan. 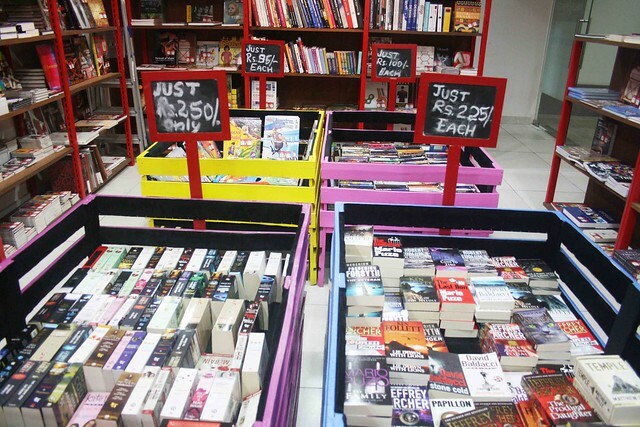 At Rs 225, they can get best-selling authors such as Jeffrey Archer, Ken Follett and Mario Puzo. Most pulp fiction titles are in the range of Rs 400-500. In a shelf reserved for South Asian literary fiction, I spotted only a few familiar names, such as Nadeem Aslam, Kamila Shamsie and Vikram Chandra. Since the store assistant claims the stock will be replenished every fortnight, there will hopefully be more interesting choices by the time you read this. The shop’s most exciting section is on cookbooks: dozens of recipe volumes, autobiographies and exquisitely designed food books. The steal is cookbook editor Judith Jones’ excellent memoirs The Tenth Muse. Priced at Rs 1,125, it’s selling for Rs 375. Muslim Talk – "Ammi was Shocked to See Half-Naked Girls in Barista"